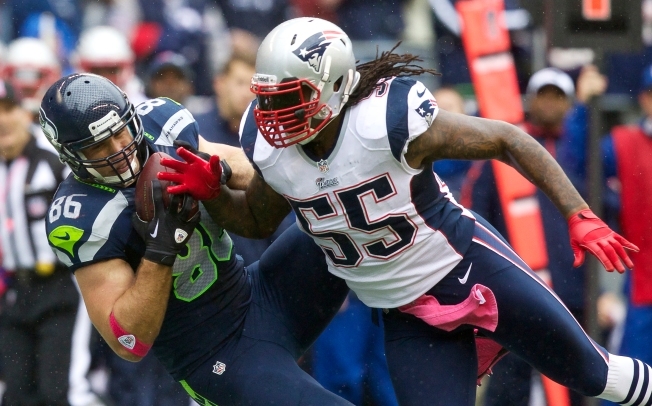 The New England Patriots have confirmed that they released linebacker Brandon Spikes on Monday morning. He was cut by the team a day after police found his car abandoned near the scene of a crash on Interstate 495 in Foxborough, Massachusetts. OnStar representatives told Massachusetts State Police the driver reported hitting a deer. The 2011 Mercedes-Benz Maybach was found in the median with front end damage around 3:30 a.m. According to police, no deer was found in the area, but nearby, a car was rear-ended on I-495 northbound. Three occupants of the vehicle required hospitalization. It is not yet known who was driving the Mercedes, and police could not confirm what car hit the Nissan. No arrests have been made, and state police said the investigation is ongoing. Spikes, 27, is a five-year NFL veteran. He played for the Patriots from 2010 to 2013 before signing with the Buffalo Bills. He was re-signed by the Patriots just three weeks ago and was expected to be a backup.